Laminitis cases, Dr. William Moyer says, are on the increase--owners are setting their horses up for the disease. 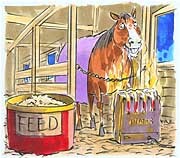 "I see horses getting heavier, horses boarded in heated barns, horses being excessively blanketed, horses kept in stalls 24 hours a day. We're killing them with kindness. "Likely candidates are the underworked, overweight individuals," the Texas A&M veterinary professor adds. "Show horses, broodmares and stallions are at risk. Fat quarter horses on the show circuit and ponies are more at risk. Horses with a prolonged or serious illness, such as colic diarrhea or retained placenta, are very likely candidates. Race horses, endurance horses, three-day event horses and wild horses, in my opinion, have lower incidence." "Think of laminae and lammelar structures as being like hooks and loops attaching and suspending the coffin bone within the hoof," Moyer says. In terms of a human analogy, the hoof wall is the fingernail, the laminae and third phalanx lie underneath, and the small bone at the top of a human finger represents the coffin bone. "Obviously the similarity ends with regard to function and load," he adds. Failure of the lamellar attachment results in loss of the suspension of the coffin bone within the hoof capsule. The coffin bone descends (rotates, sinks or both) toward the sole of the hoof. The resultant shearing and tearing of veins cuts off the flow of oxygen-rich blood, killing living tissue. "Laminitis presents a real problem because by the time the owner is aware a problem exists the destructive process has already occurred," says Moyer. "Also, pain is not always an accurate measure of the degree of destruction--in other words, an affected horse could appear somewhat comfortable." Most affected horses are reluctant to move, especially to turn. The front feet are difficult to pick up, and the pulse is pounding. The more pained will take a "sawhorse" stance. "I think it's safe to say that horses showing a sudden onset of lameness in both front feet--sometimes even all four--are foundered until proven otherwise," Moyer says. "But be aware that the signs of laminitis can easily be masked by another event, such as colic." If you suspect laminitis, call your veterinarian immediately. Attempt to get the horse into a comfortable environment. Do not treat the problem yourself, and do not pull the shoes unless instructed to do so by a professional. Avoid shipping the horse unless you have no choice. Events that set the stage for laminitis include gastro-intestinal, respiratory, reproductive, renal (kidney), endocrine (hormonal), skin, musculoskeletal and immune system problems. Other causes can be traced to toxins, such as those on black walnut shavings or those produced by bacteria such as salmonella. Long-distance shipping, changes in the environment and feeding practices can cause problems. Unilateral (one-limb) laminitis can occur with prolonged and unequal weight bearing. An equally large category can be titled "unknown," where there is no history of illness, no change in environment or feed. "Remember that something happened to trigger this event (see sidebar), and inappropriate treatment of the problem is potentially harmful," Moyer cautions. When your vet arrives, he will conduct a physical exam of your horse. Understanding the total picture is important in figuring out what happened to trigger the disorder. "X-rays of the suspected feet will be part of this exam, although there is a lag between the triggering event and apparent damage to the hoof," Moyer notes. As the case develops, treatment and management evolve. "First of all, very little factual information exists with regard to the assessment of the various treatments and management practices that have been used," says Moyer. In some cases, the degree and severity of damage exceed the ability to fix it or make the horse comfortable. Treatments can be expensive over time, and labor intensive. "The treatment in chronic cases with structural damage varies, " says Moyer. "You can use corrective trimming and shoeing; relief can be attained in some cases by cutting the deep flexor tendon; there are myriad chronic-use medications, but these can cause problems down the road." Long-lasting affects of laminitis include toe-wall separation (seedy toe) or rings around the hoof. Deformity in the lower limbs is not unusual. Recurring pain and lameness are common. Sole bruising and abscesses under the hoof wall or sole may occur frequently. Laminitis has been a major problem in the horse world for centuries, but it could be a while yet before it gets the research dollars it deserves, Moyer says. "For humane reasons, it is difficult to research painful diseases. Laminitis--for all the problems it causes--therefore remains an unsolved dilemma." Read the next horse diseases article on Mare Reproductive Loss Syndrome (MRLS).